Nine youngsters from youth facilities and five children from the village will participate in the 31-kilometre-race and some of them have set themselves clear targets. "The last time the race took place I came 62nd; now I want to be among the first 30," says 16-year-old Marko. "I hope to accomplish the mission, although much will depend on the weather and the wax," says the boy who is also the village's ski training group coach. The training group is rather small with two regular and 5-6 irregular participants, but Marko is more concentrated on his own form. "I am in good shape, almost close to my maximum at the moment," says the boy. He has trained skiing for eight years and has skied approximately 300 km this winter. "I was the best skier last time and I think nobody from the village will beat me," says Marko who does 15-20 kilometres a day. "With this kind of training the 31 kilometres are not a problem. Next year I will compete in the longer distance, which is 64 kilometres." 17-year old Reet says that although she has no time to train as much as Marko does, she will give her best to beat her brother. "School takes almost all of my time but I will give my best and we will see what will happen. My aim is to win over Marko." Experience is in her favour as she has already participated four times in the marathon, whereas Marko has only been there three times as of now. Nevertheless, Marko remains defiant of being the best skier of the SOS Children's Village and considers it fighting himself. "Waxing is the whole science and I will wax the skies myself, this will take lots of hours and the distance takes endurance. But moreover, this is a mental challenge," he emphasizes. 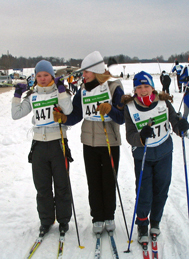 This year, over 5,000 skiers will participate in the 38th Tartu Ski Marathon.